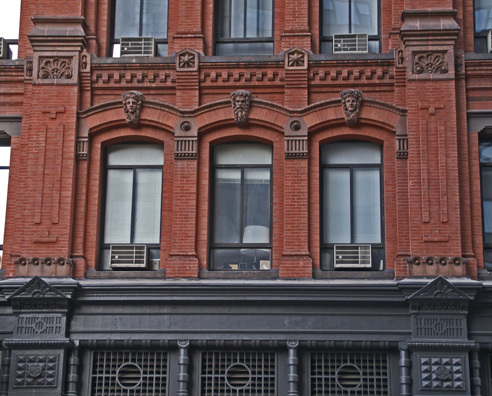 This very handsome, 7-story building at 1 Astor Place was designed in 1881 for Orlando Potter by Starkweather & Gibbs in a highly articulated Victorian style with red-brick and terracotta facades and a cast-iron base. The building has a chamfered corner and its facade along Astor Place is slightly bent in two places. The building's facades are heavily modulated with deeply, multiple-framed, inset windows and an abundance of decorative detail including dentilated spandrels, keystone heads, a variety of pilasters, elaborate capitals and banded columns. The building has a one-step-up entrance with three glass marquees leading to a revolving front door. The building, which has entrance sconces, has a concierge and about 175 rental apartments. It permits protruding air-conditioners but has no sidewalk landscaping, no roof deck and no garage. Astor Place runs from Broadway across Lafayette Street to Third Avenue and was named for the fur trader John Jacob Astor who had bought a large tract of land on the site in 1803 and when the street was "opened" in 1836 its "angled intersection with Lafayette and Fourth Avenue created something of a ceremonial air, especially as it continued east to connect with another diagonal street, Stuyvesant Street," Mr. Gray observed. In 1847 the Astor Place Opera House opened on the narrow triangle of land at 13 Astor Place. Two years later, in May 1849, one of New York's worst civil disturbances, involving thousands of unruly protesters, took place. Partisans of the American actor Edwin Forrest, incensed by the appearance at the opera house of the English actor William Macready as Macbeth, threw paving stones into the theater, starting a disturbance that was ended only after the National Guard was called in and 22 people were killed. 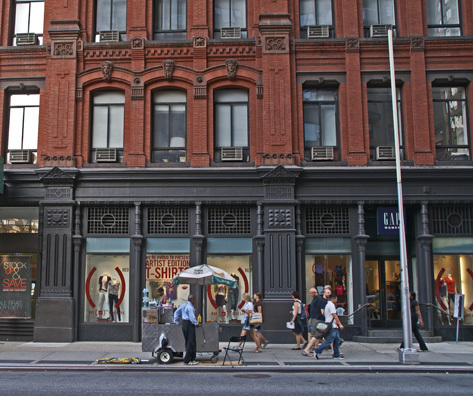 In his March 2, 2003 "Streetscapes" column in The New York Times, Christopher Gray wrote "In 1853 the American Bible Society built Bible House, its six-story office and printing building, on the site of what is now Cooper Union's 1950's engineering building,'' adding that "The next year, the Astor Library, the city's first large library available to the public, opened on Lafayette. Its building is now the Joseph Papp Public Theater. That same year," Mr. Gray continued, "the old Astor Place Opera House was remodeled as Clinton Hall, which included space for the New York Mercantile Library, established in 1821 as a public institution for clerks and business owners. The original Cooper Union building went up in 1859. By 1870 the Merc - as it came to be known - was the fourth largest library in the United States, with 140,000 volumes and a membership of almost 11,000, with 1,000 patrons a day." 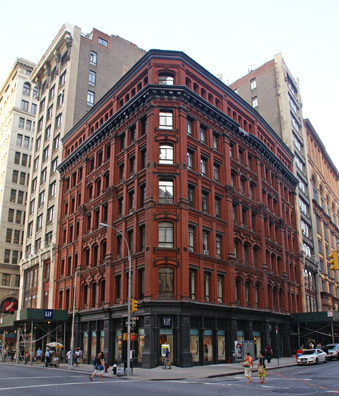 This building was erected in 1881, five years after its developer, Orlando B. Potter, had built 10-20 Astor Place, a building designed by Griffith Thomas on the southeast corner of Lafayette Street. "By this time," Mr. Gray wrote, "Bible House and the Mercantile Library had attracted publishers to Astor Place, among them Thomas Crowell and John Wiley in the Mercantile Library building and Isaac Funk and Adam Wagnalls in 10-20 Astor Place. IN 1891, Potter switched designers again, hiring Francis H. Kimball for an office building at 4-8 Astor Place. The design was not as ornate as Starkweather & Gibbs's, but the building does have elaborate quoins, or corner blocks, articulated with intricate vermiculation (the architectural term for a wormlike pattern in a stone surface). In 1892 the Mercantile Library put up a new office and library structure of brownstone and straw-colored brick - designed by George Harney - on the triangular site of the old Clinton Hall. The library took the sixth and seventh floors for a vast reading room with high bookstacks. After the Mercantile Library sold its building in 1920, it remained a tenant and a subsequent owner added two floors." The Elad Group, a New Jersey developer, bought the old Mercantile Library building for $41.5 million in 2002 to convert it into 49 residential condominium units. It overlooks Tony Rosenthal's very popular "Alamo" metal sculpture that was installed in 1956 on a small traffic island at Astor Place and Eighth Street. In 1936, the American Bible Society left Bible House where it had had been producing three Bibles a minute, 24 hours a day, since 1853, and the building was demolished in the 1950s and replaced by a six-story engineering building for Cooper Union that was eventually sold in the early years of this century to Edwin Minskoff. By 1967, when Tony Rosenthal's near-cubic sculpture ''Alamo'' was installed on the small traffic island at Astor and Eighth Street, Astor Place was a gritty connector between the musty lofts along the Broadway corridor and the ramshackle East Village neighborhood beyond Third Avenue. The Related Companies erected a sinuously curved glass residential condominium tower on the parking lot at Astor Place and Lafayette Street on land it leased from Cooper Union. The 22-story free-standing tower became an instant new landmark for the East Village and was designed by Charles Gwathmey, who died in 2009. Initially called the "Sculpture for Living," the tower, whose address is 445 Lafayette Street, was known for a while as "One Astor Place," which was a little confusing. Orlando Potter's heirs built 740 Broadway at the southeast corner of Astor Place in 1912.